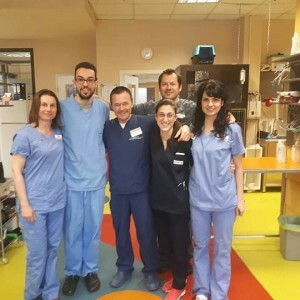 FIRST REPORTED CASE OF SYMPTOMATIC DIROFILARIA IMMITIS INFECTION IN A HOUSOLED DOMESTIC FERRET (MUSTELA PUTORIUS FURO) IN BULGARIA. 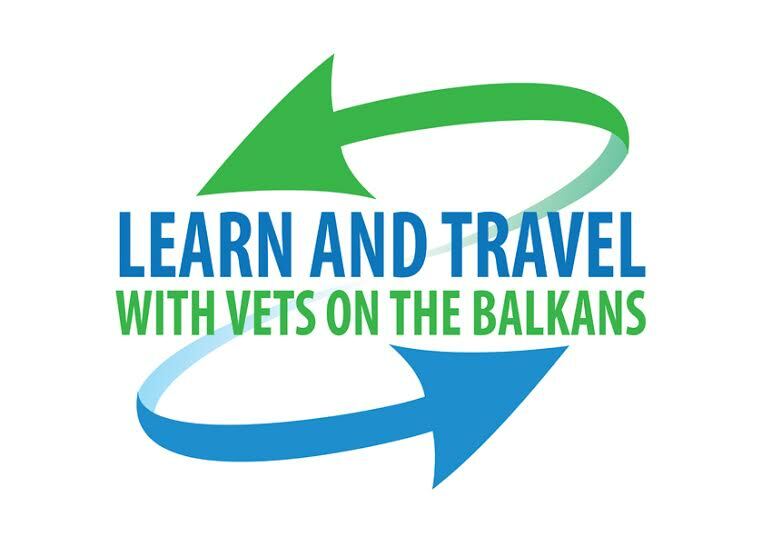 Heartworm disease in dogs and cats is well known in many European countries including Bulgaria. 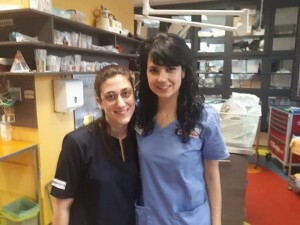 There are furthermore studies confirming dirofilariosis in wild foxes and Canis aureus i reports about heartworm disease in domestic ferrets in our country. A 5 year old male, entire, pet ferret (Mustela putorius furo), weight 0,9 Kg was presented with labored abdominal breathing. 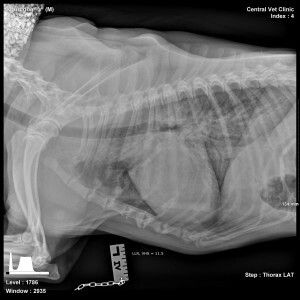 The owner reported reduced appetite, difficulty breathing and restlessness. The ferret was not able to sleep or lie down for more than few minutes. The ferret was used to live mainly indoor and allowed during the summer to be outside in the garden, for just few hours during the day, to be exposed to natural sunlight. 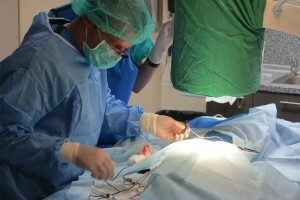 On presentation ferret was lethargic with abdominal breathing and breathing rate up to 90/minute. There was clear subcutaneous edema more prominent on the front and hind legs and ventral part of the abdomen. 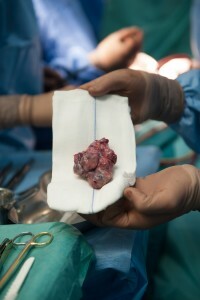 Mucous membranes were pale, while CRT was not possible to be assessed. Heart rate ranged in between 120-180 bpm. Pulses were weak even if assessing on the femoral artery was difficult due to the subcutaneous edema. Abdominal palpation was unremarkable, lymph nodes were normal in size. 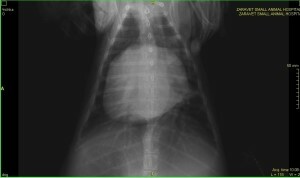 Thoracic radiograph showed loss of detail into thoracic cavity consistent with pleural effusion. Thoracic US was performed confirming pleural effusion and one hundred and twenty ml of modified transudate was drained. Brief screening echocardiography showed normal left atrium and left ventricle and severely dilated right atrium containing double line hyperechoic objects suggesting the presence of few adult Heartworms. (Fig 1). Right atrium was larger than left atrium. 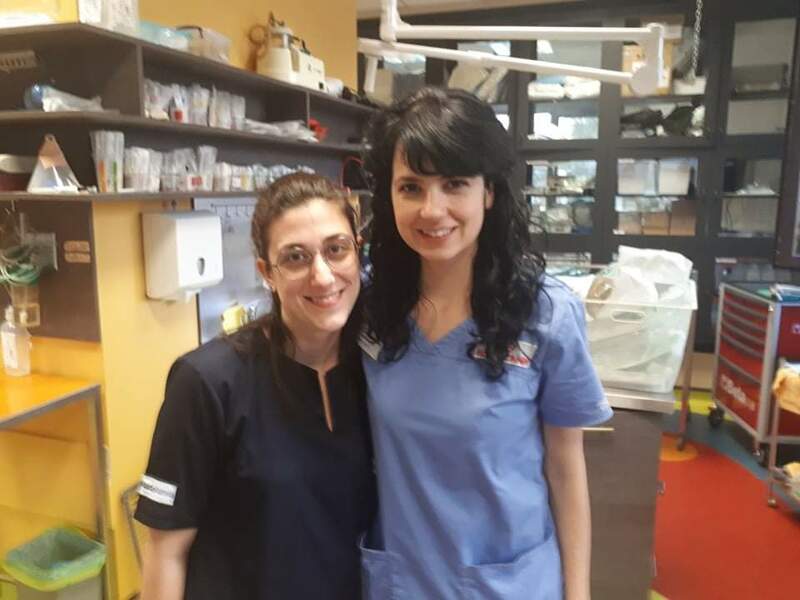 Doppler study and any further detailed investigation of the heart were not possible to be performed due the fact ferret became aggressive and owner declined any sedation or anesthesia. Snap® HTWM Antigen test (Idexx) on blood yielded negative result and at fresh blood smear examination no microfilariae were possible to be identified. 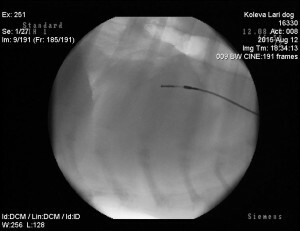 Knott test was not possible to be performed due to limited amount of sampled blood. 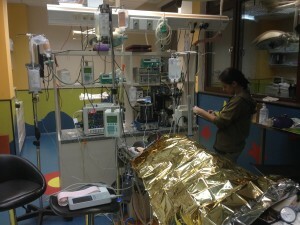 On the basis of echocardiography findings diagnosis of HW disease was done. 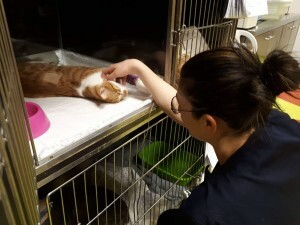 Negative HW antigen test was assumed to be due probably due to juvenile D.immitis worms and right atrium localization to the small size of pulmonary arteries as described in cats and ferrets. 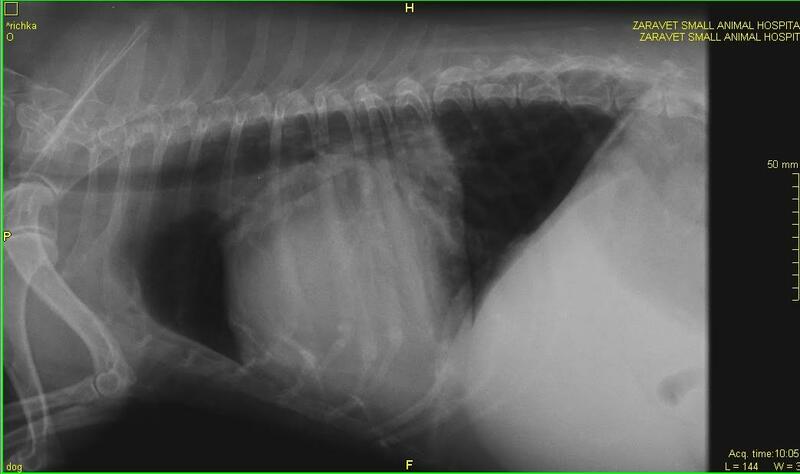 The ferret was treated with Advocate® spot on >4kg (half tube), Furosemide 2mg/kg twice a day and Prednisolone 1mg/kg daily both of them orally. The ferret was stable on that therapy. 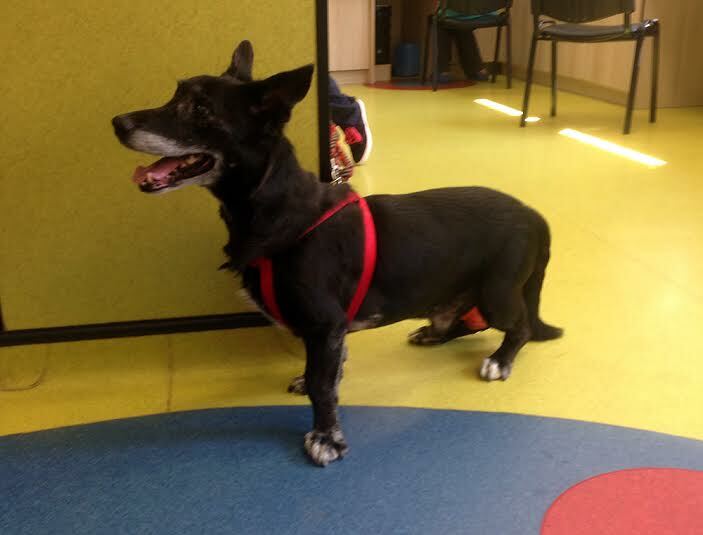 He was eating and drinking well regain the normal body weight 1.5 kg. no breathing difficulties were reported. He was rechecked 35 days after initial presentation. 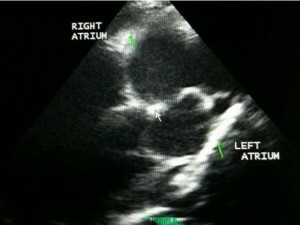 Echocardiography showed right mildly dilated atrium but no presence of HW (Fig 2). 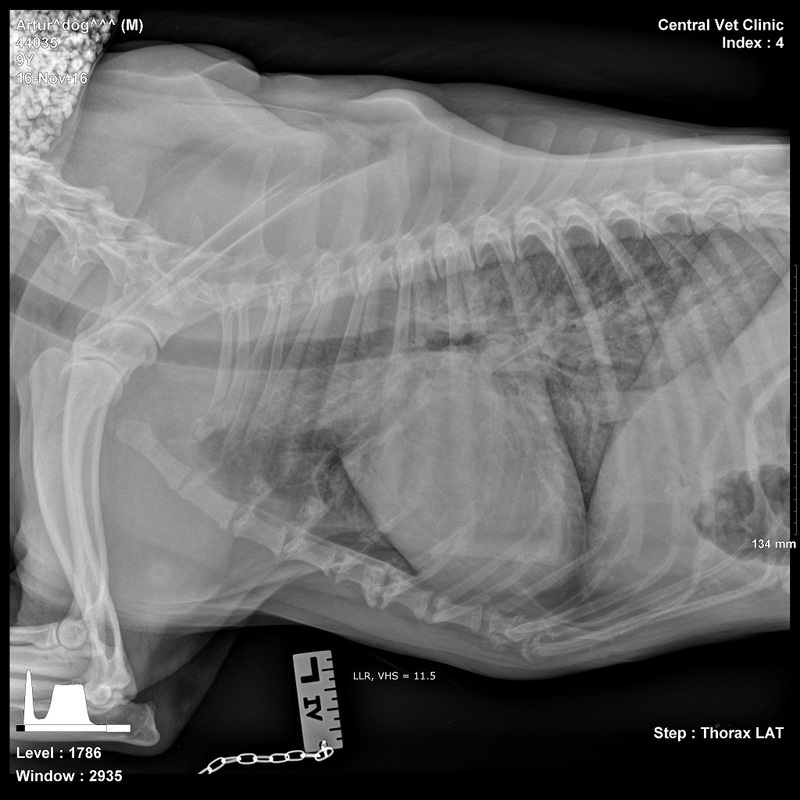 Only 10 ml of fluid was drained from the thoracic cavity. From that time he was stable with no owners complain for 6 month. 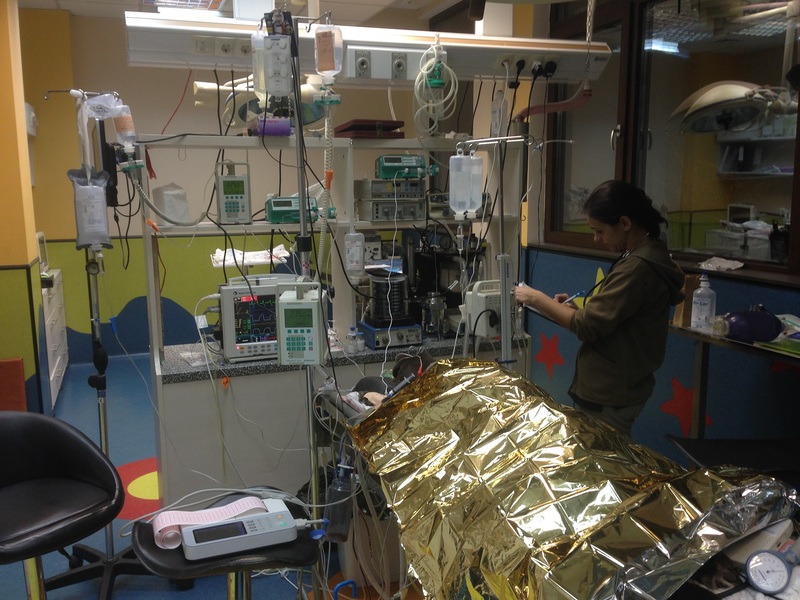 Suddenly he developed respiratory distress and on presentation was with cyanotic membrane. 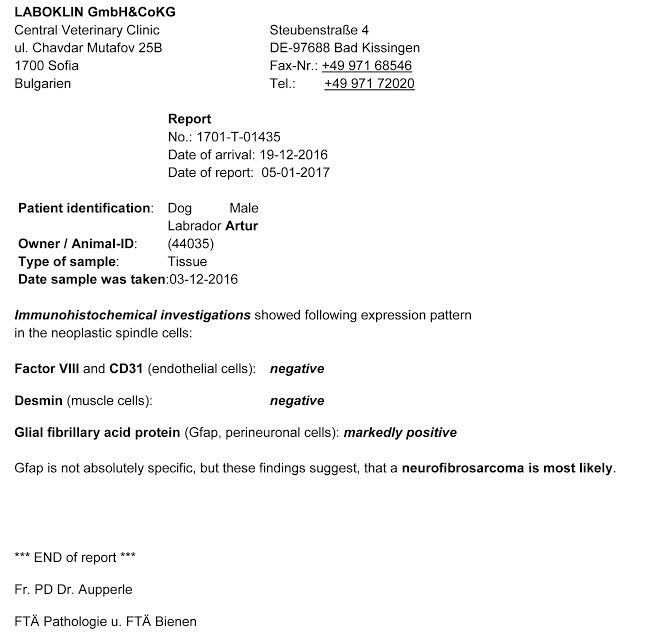 Pulmonary thromboembolism connects to HW disease was suspected Owner elected euthanasia and no more investigations. Necropsy was declined. This case shows the in endemic area even indoor domestic ferrets may be infected by Dirofilaria immitis. and that the disease is difficult to be diagnosed and can lead to death. Suspicion about this problem and monthly chemoprophylaxis should be warranted in this situation as in dogs and cats. 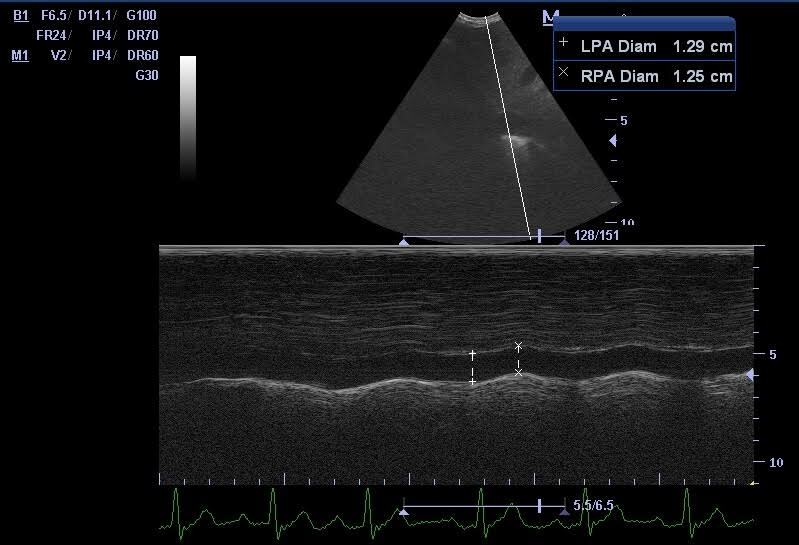 Diagnosis and therapeutic management in a a dog with severe cardiac dilatation associated with complex arrhythmias – A case report. 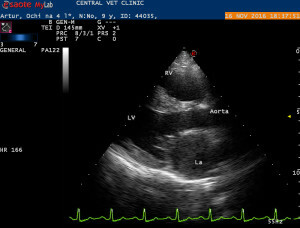 Cardiac dilatation is a common finding in dogs with heart disease. Chronic myocardial stress and volume overload are the main reasons for cardiac remodeling. These changes are encountered in most of chronic diseases such as dilated cardiomyopathy, mitral valve disease or congenital disease that develop volume overload. Cardiac dilatation should not be confused with dilated cardiomyopathy (DCM), which is known to be a myocardial disease induced by several specific factors such as genetic or familial predispositions. 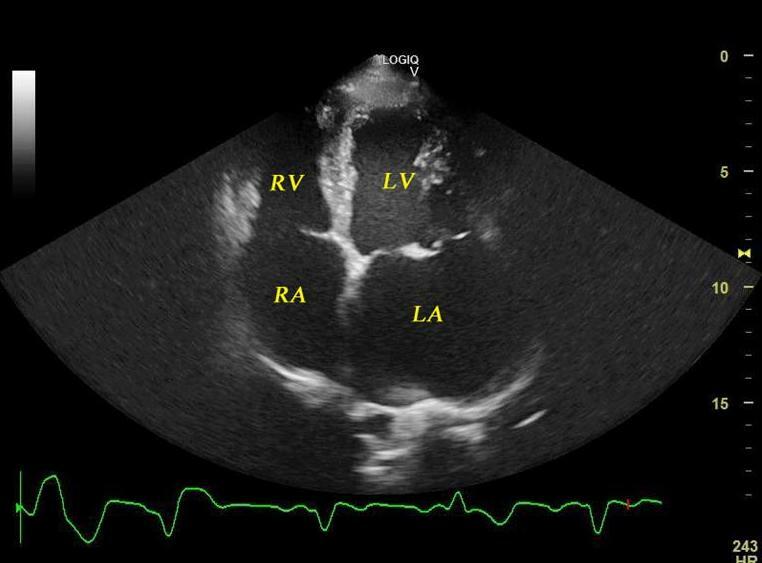 In the absence of specific signs, such as mitral valve degeneration or congenital heart diseases, cardiac dilatation should be carefully evaluated and additional tests must be performed before deciding the diagnosis and therapy. 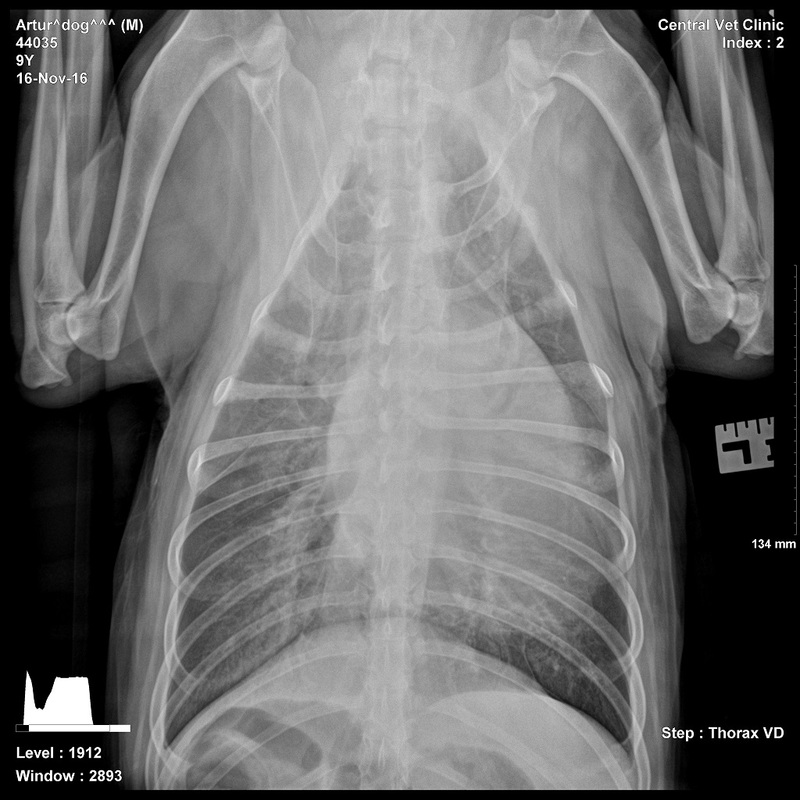 In veterinary medicine, there is insufficient data regarding the differential diagnosis of cardiac dilatation when specific sins are absent. 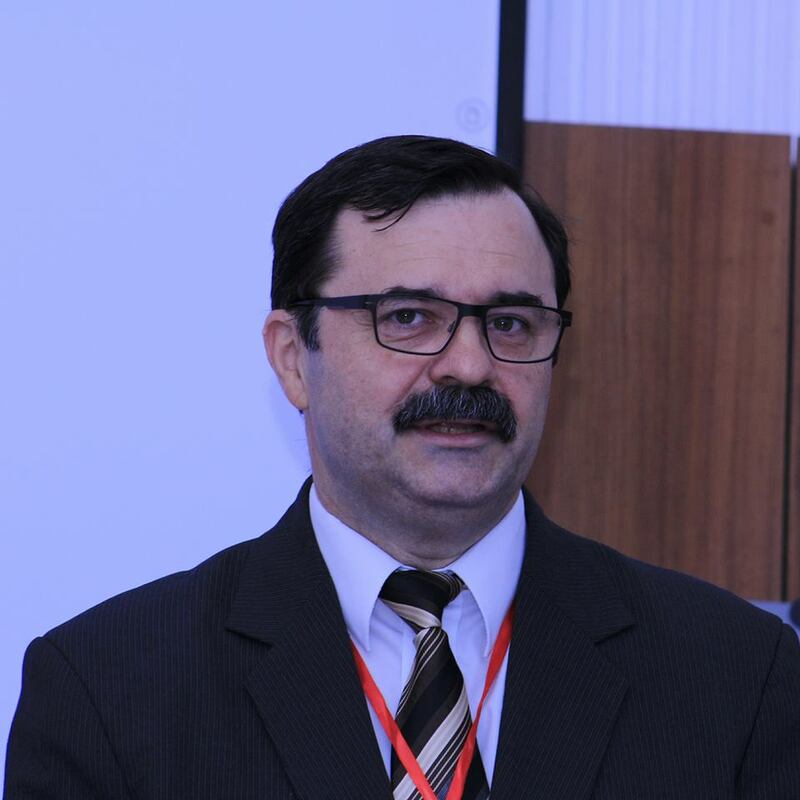 The aim of this paper is to report and discuss a patient with congestive heart failure due to severe cardiac dilatation associated with multiple arrhythmias and to describe the diagnostic protocol, therapy and evolution of the disease. 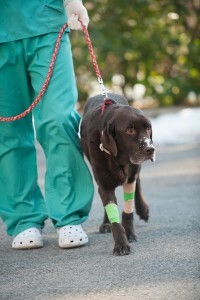 An eleven years male, German Shorthaired Pointer dog, weighing 38 kg, was referred for a second opinion to our Cardiology Service from the Teaching Hospital of the Veterinary Faculty of Iași, because of chronic abdominal fluid accumulation, severe effort intolerance and weight loss for the past few months. 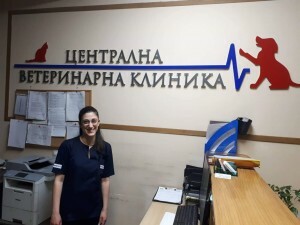 The dog was receiving cardiac therapy assigned by the referring clinician and consisted of pimobendane (Vetmedin® Boehringer Ingelheim), 0.25 mg/kg P.O. BID and furosemide (Furosoral, Artesan Pharma GmbH & Co.), 2 mg/kg P.O. BID. 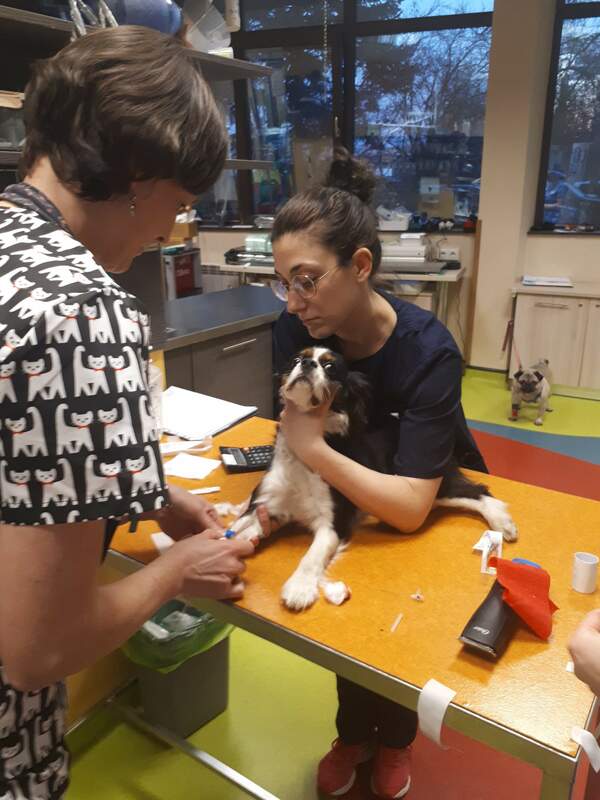 The owner reported that the dog had been treated for Babesia canis for four times in the past few years. 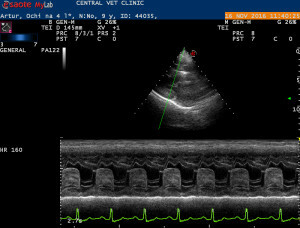 During the first visit, the dog was subjected for complete cardiologic examination consisting of physical examination, five minutes six leads electrocardiography (PolySpectrum veterinary device), blood pressure measurement (Vet-HDO blood pressure device), cardiac ultrasonography (Logiq V5, General Electric), cardio-thoracic radiography (Intermedical Basic 4006 X-ray machine and Examion X-CR smart digital developing machine) and biochemical and CBC blood analyses as previously described [1-4]. Physical examination showed pink mucosal membranes, with a CRT of 3 seconds, abdominal distension, breathlessness, with a normal respiratory rate (28 bpm), strong and arrhythmic cardiac beats, without precordial thrill. 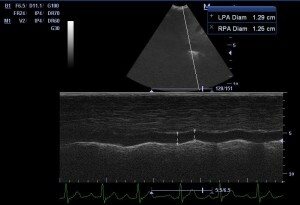 The palpation of the femoral artery revealed weak asynchronous arterial pulse. 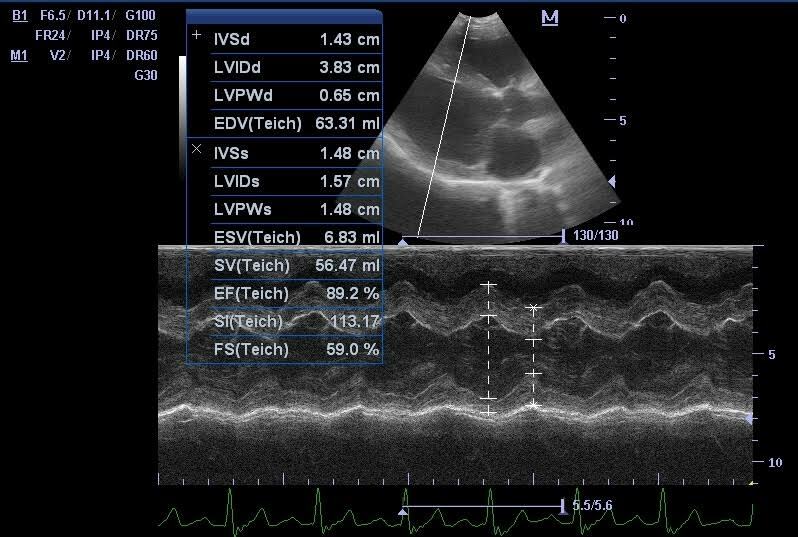 Auscultation revealed an arrhythmic rhythm and III/VI systolic plateau left apical murmur. Auscultation of the lungs revealed crackles in both sides of the caudal lung lobes. 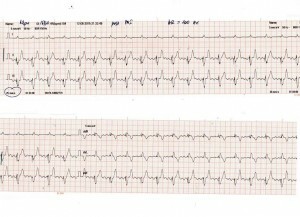 Electrocardiography revealed an arrhythmic rhythm with a median heart rate of 130 bpm, with more types of arrhythmias present over the five minutes ECG tracing. 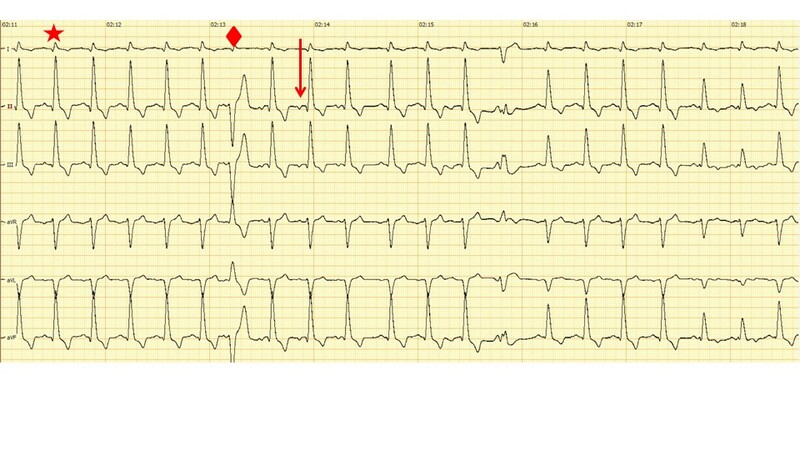 The predominant rhythm was accelerated idioventricular rhythm, with a heart rate of 168 bpm, interrupted by runs of supraventricular tachycardia, with a heart rate of 240 bpm and sinus tachycardia with a heart rate of 165 bpm (Fig no 1). 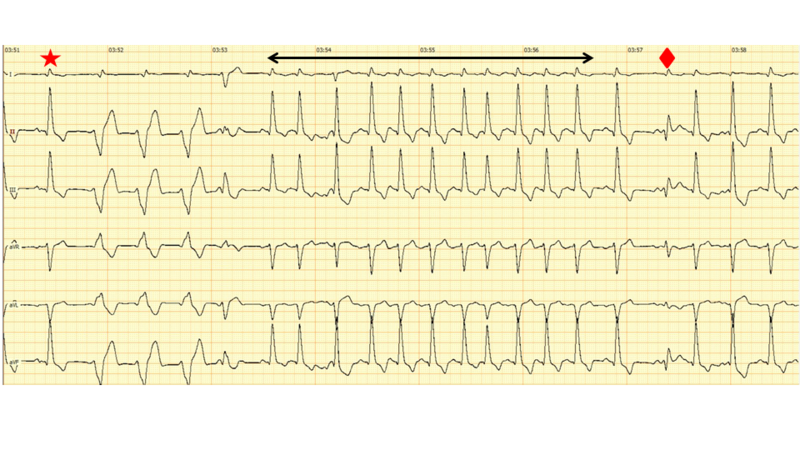 There were also present runs o junctional beats with a retro-conducted P-wave. 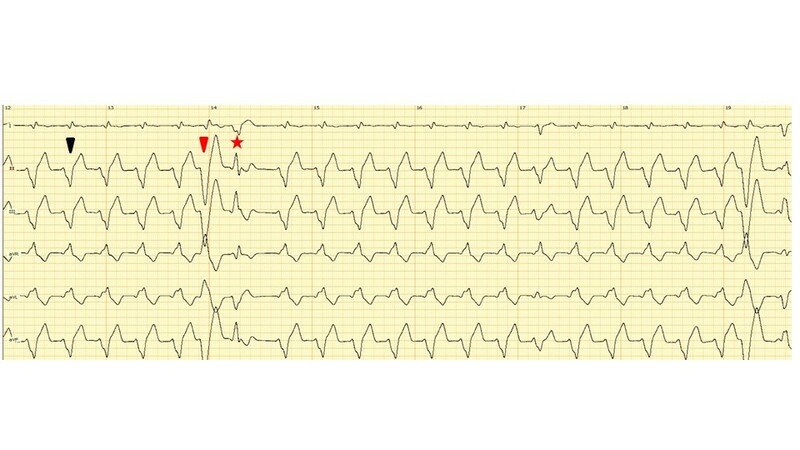 Between these sequences of arrhythmias, there were present 25 left ventricular premature complexes, with the same morphology, with a negative polarity in DII, DIII, and aVF and positive polarity aVR and aVL. These complexes had a length of 120 msec and a tall, opposed T-wave. 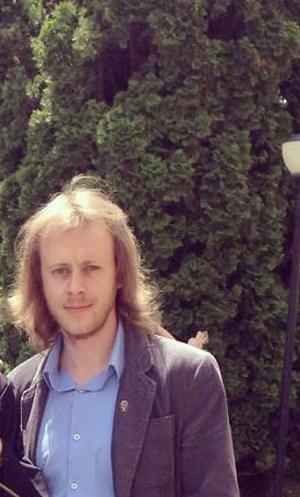 Multiple fusion beats were also present (Fig no 2 and 3). The blood pressure measurement was performed with a D1 cuff placed on the tail and simultaneous recording of the pulsating-wave graphic. However, measurements of the blood pressure were not accurate due to the differences in the pulsating wave. 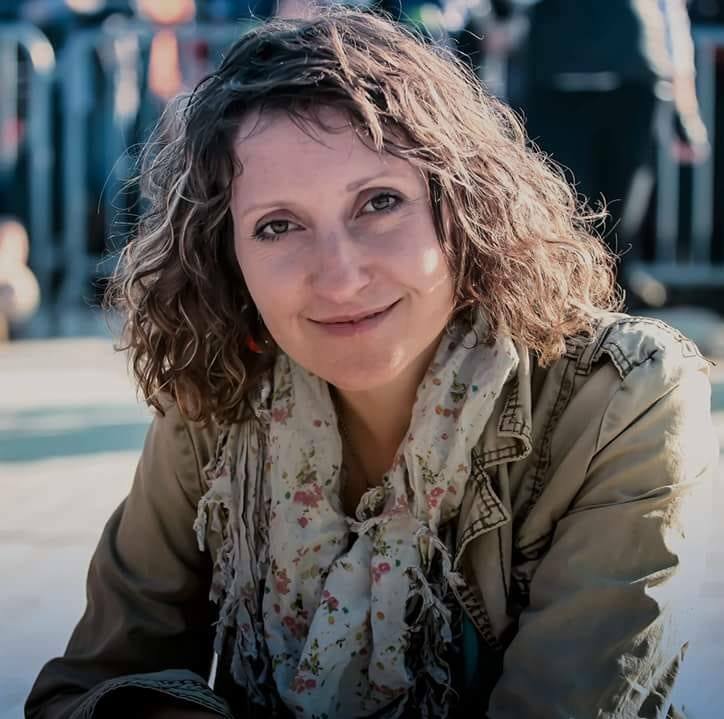 Fig nr. 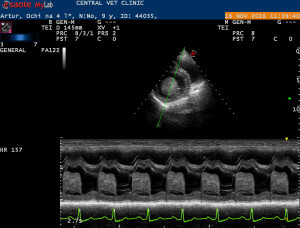 6 Echocardiographic M-mode in right parasternal short axis view through the papillary muscles of the left ventricle of the same dog with signs of congestive heart failure. 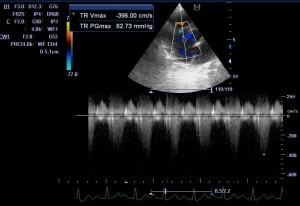 Arrhythmic contractions of the left ventricle are visible. The free wall and septum appear thinned and the ventricular cavity is enlarged in both systole and diastole. 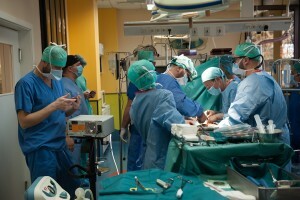 The measurements were performed when the rhythm was supraventricular. The shortening (SF%) and ejection (EF%) fractions are within normal limits. 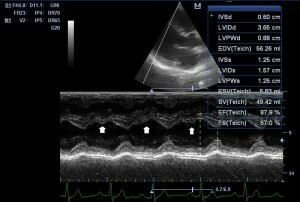 Cardiac ultrasonography revealed severe left ventricular dilatation during systole (39.6 mm 95%CI 15.8-17.18 mm) and diastole (64.2 mm, 95% CI 37.64-39.1 mm), with thinned interventricular septum and ventricular free wall and severe left atrial dilatation, with a LA/Ao ratio of 2.54 (normal upper limit 1.6). Also, the left auricular cavity was visibly enlarged. 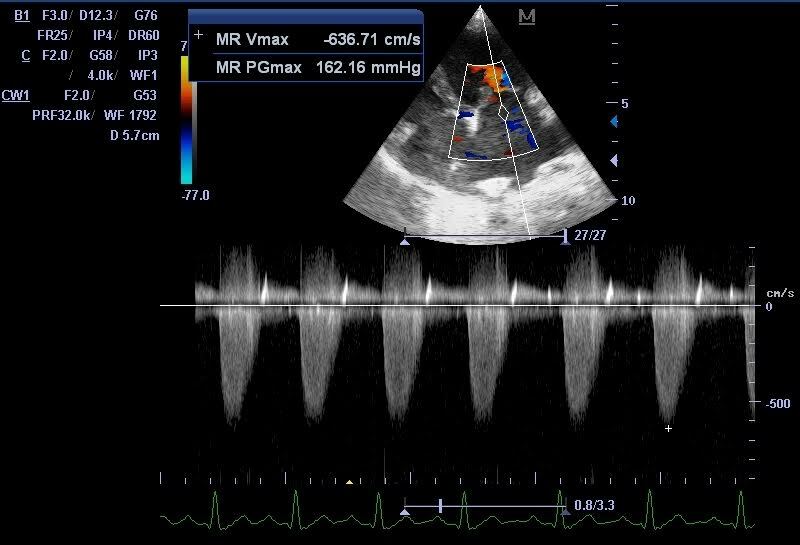 The mitral valve was thin with normal echoic appearance and abnormal motion due to the hemodynamic changes induced by the underlying arrhythmia and a regurgitating jet was observed by color doppler. 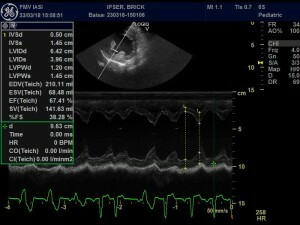 The left ventricle systolic function was within normal limit, when assessed during supraventricular rhythm (SF%=38, EF%=67). 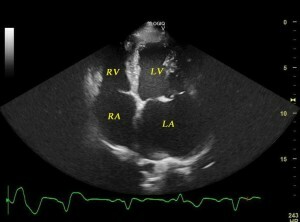 The pulmonary and aortic flow were laminar, within normal ranges. 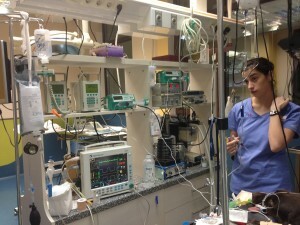 There were no signs of pulmonary hypertension. The pericardium was normal, without fluid accumulation (Fig no 4-6). 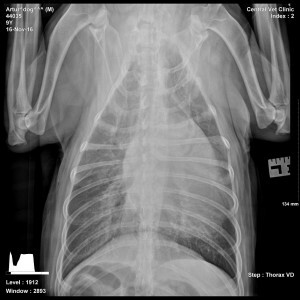 A left lateral thoracic X-ray was available for examination and revealed severe cardiomegaly, with a VHS of 13.3v. 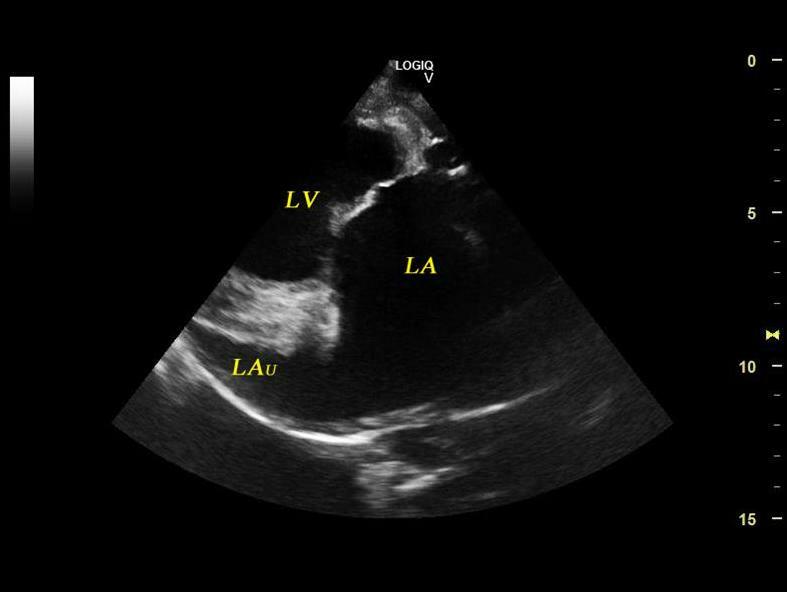 The trachea was dorsally displaced and a perihilar pulmonary interstitial and alveolar pattern was visible in the caudal lung lobes consistent with moderate cardiogenic pulmonary edema. A round radiopaque area was present over the gallbladder topography and a gallbladder stone was suspected (Fig no 7). Blood biochemical analyses were within normal ranges except a moderate hypoalbuminemia (2.5 g/dL normal ranges 2.6-4 g/dL) and moderate increased alanine aminotransferase (58 UI/L, normal ranges 8-57 UI/L). 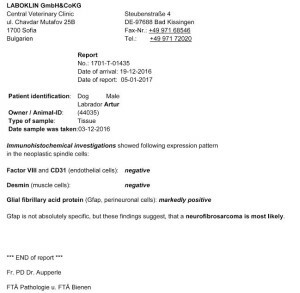 Cell blood count was within normal ranges. The diagnosis consisted of idiopathic dilated cardiomyopathy with supraventricular and ventricular arrhythmias. The current therapy was maintained and amiodarone (Amiodaronă LPH, LABORMED PHARMA S.A.), was added as following: 15 mg/kg P.O. BID for 7 days, followed by 7.5 mg/kg P.O. BID for the next seven days and 7.5 mg/kg P.O. QD for the next fourteen days. 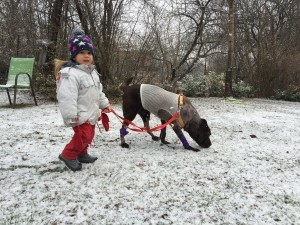 The dog was released from the hospital the same day with effort and salt restriction. 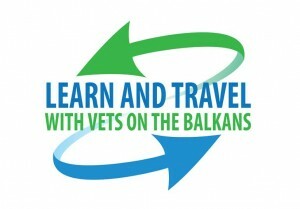 The reevaluation was scheduled after 2 weeks if no event required a sooner visit. Three weeks later, the owner called for a reevaluation. 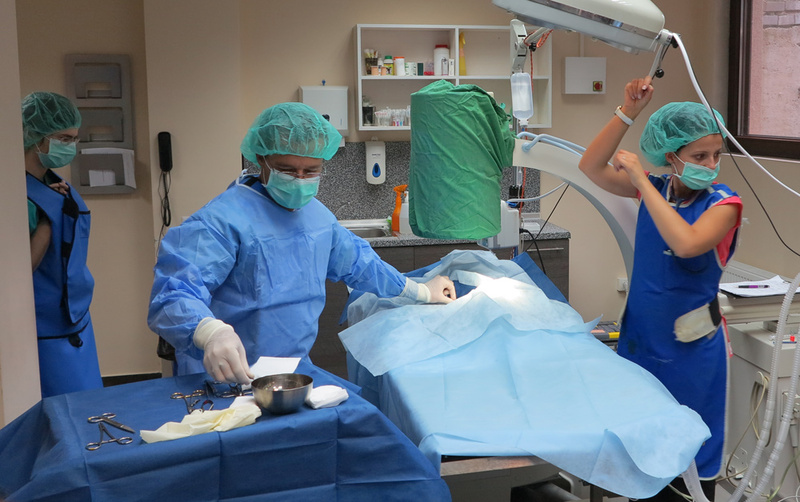 The medication was administered according to recommendation and no events were observed during this period. aA significant improvement in the quality of life of the patient was reported. The dog was alert and active during physical examination, with pink mucosal membranes, CRT of 3 seconds, moderate decreased respiratory rate (36 bpm) and effort, and a less distended abdomen. 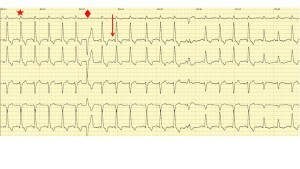 Palpation of the thorax revealed a strong cardiac beat and the arterial pulse was synchronous with the cardiac beat. 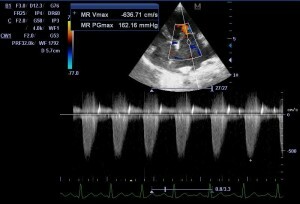 Cardiac auscultation showed rhythmic rhythm, with a heart rate of 114 bpm and III/VI systolic plateau left apical murmur. 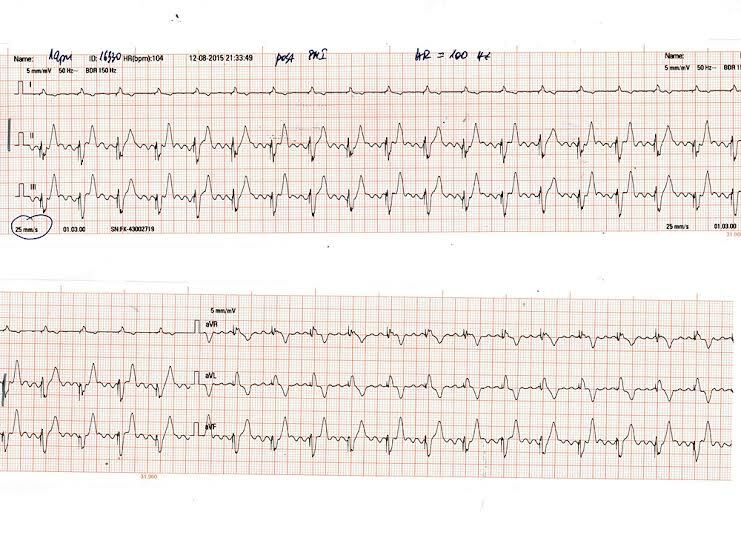 The five minutes six lead ECG tracing revealed a predominant sinus rhythm, interrupted by 107 single supraventricular complexes and only one right ventricular premature complex with positive polarity in DII, DIII and aVF and negative in DI, aVR and aVL. No sequences of supraventricular tachycardia or accelerated idioventricular rhythm were present on the five minutes tracing. 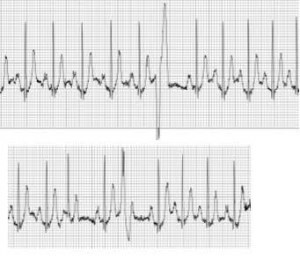 The abnormalities in morphology of the sinus beats revealed a mitral P-wave (78 msec), increased amplitude of the R-wave (3.34 mV) and increased length of the QRS complex (91 msec) (Fig no 8). 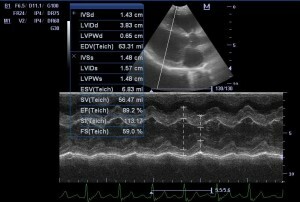 There were no improvements seen during the echocardiographic examination. The owners were instructed to administer the therapy with pimobendane and furosemide continuously and amiodarone until the end of protocol. 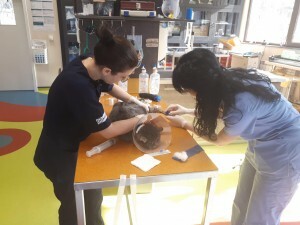 Eight weeks after the first examination, owners reported by telephone that the patient is alive and the quality of life remained improved. 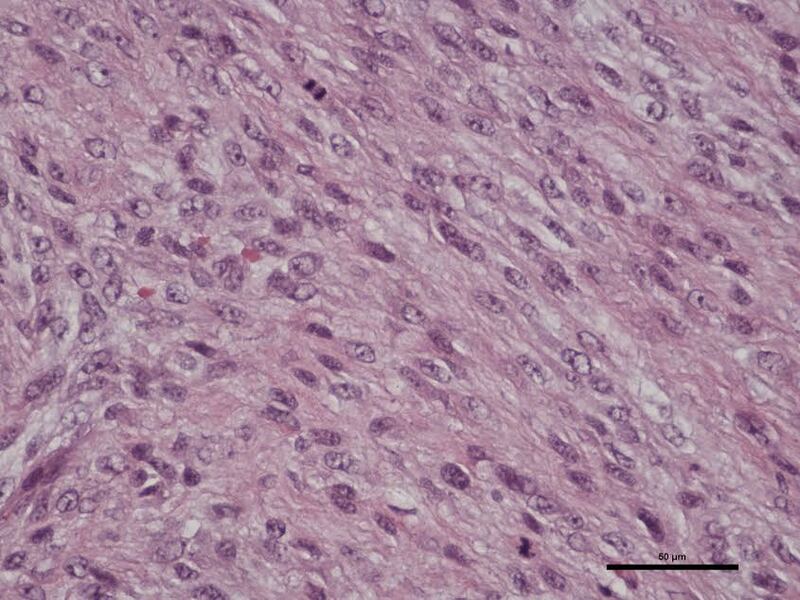 Dilated cardiomyopathy (DCM) can occur as a primary cardiomyopathy such as genetic, or familial DCM , or secondary to myocardial stress, such as drug- or toxin-induced, infiltrative, ischaemic, metabolic, nutritional, or inflammatory myocardial diseases . 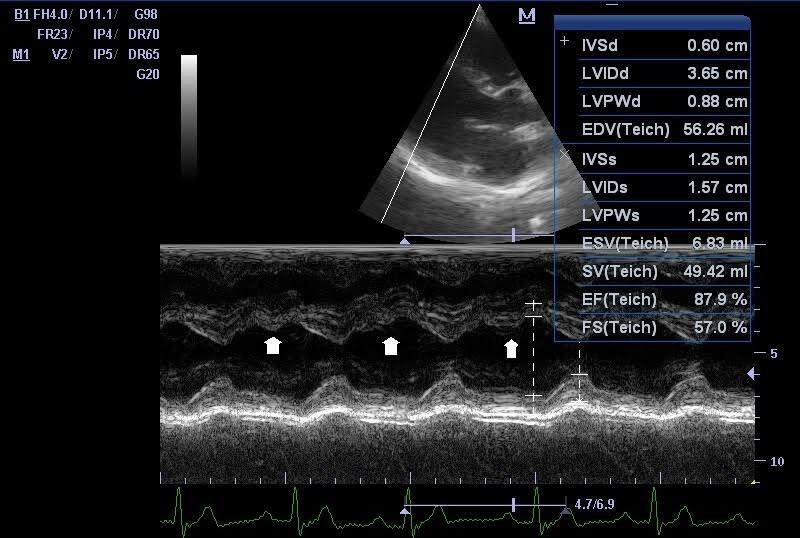 In both cases, DCM is expressed through a disease of the myocardium associated with ventricular systolic and diastolic dysfunction and development of congestive heart failure . 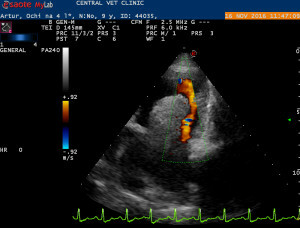 According to ESVC Taskforce for Dilated Cardiomyopathy, 2003, scoring system, the score in this dog was above 6 points, which is consistent with the presence of DCM . 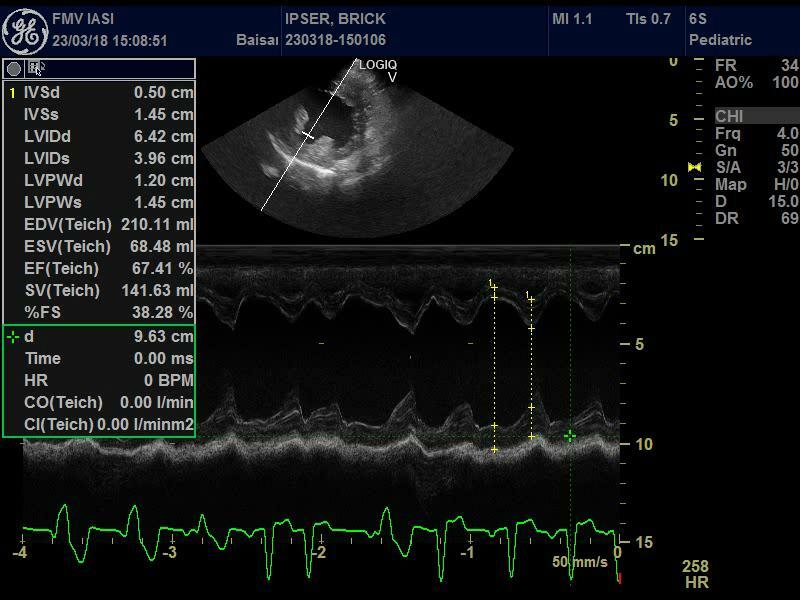 The left ventricular internal diameter in both systole and diastole were above the 95% CI based on the regression formula , the sphericity index was under the lowest recommended limit and left atrial enlargement was present. However, there were some changes that did not seem to be associated with primary DCM. The shortening and ejection fraction were within normal ranges and the large range of arrhythmias was not consistent with specific morphologic and rhythm changes in primary DCM. 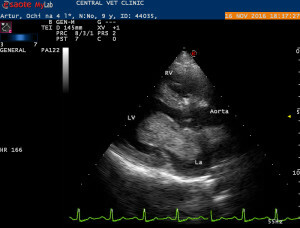 It has been suggested that atrial fibrillation is the most common arrhythmia in dogs with DCM and also, increased number of ventricular premature complexes may have diagnostic value [5, 8]. Nevertheless, it must be considered that the dog was treated with positive inotropic medication which may have influenced the systolic function of the heart. 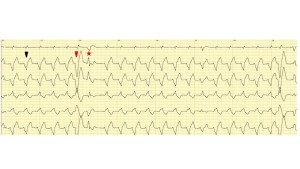 Another unexpected result was the intense positive response to arrhythmic therapy. Amiodarone is an antiarrhythmic agent with primarily class 3 action, but also potent class one. This agent prolongs the action potential duration and the effective refractory period in all cardiac tissues. It is recommended in dogs with ventricular arrhythmias and has also been used to convert atrial fibrillation to sinus rhythm . 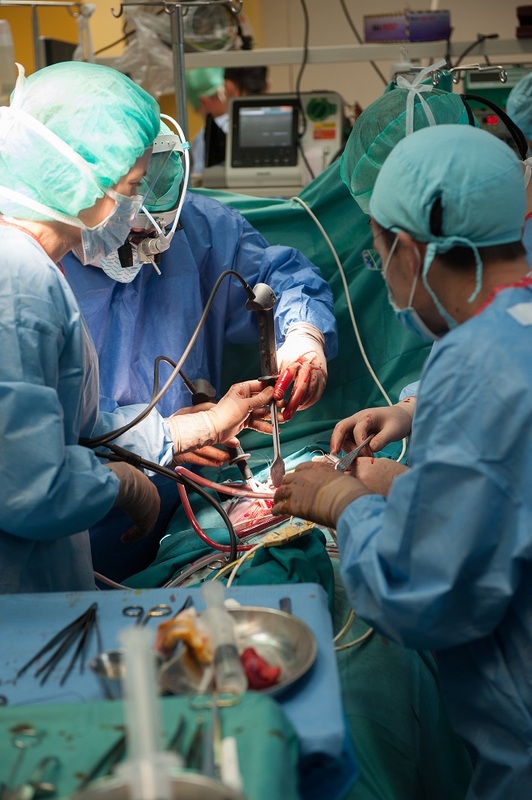 The differential diagnosis for cardiac dilatation should include secondary DCM due to cardio-toxicosis, drug-induced, metabolic or nutritional factors, chronic myocarditis or tachycardia-induced cardiomyopathy (TIC). Secondary DCM is difficult to diagnose due to the multiple factors of environment and microclimate. 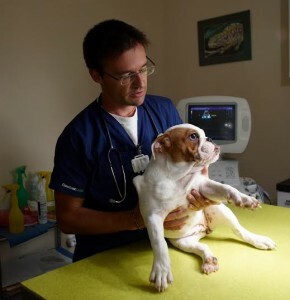 A large series of pathogens have been reported to induce chronic myocarditis, including canine babesiosis [10-15]. 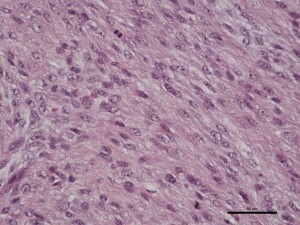 However, in most studies, the etiological diagnosis was reached through histopathological examination of the cardiac tissue after patient’s death . 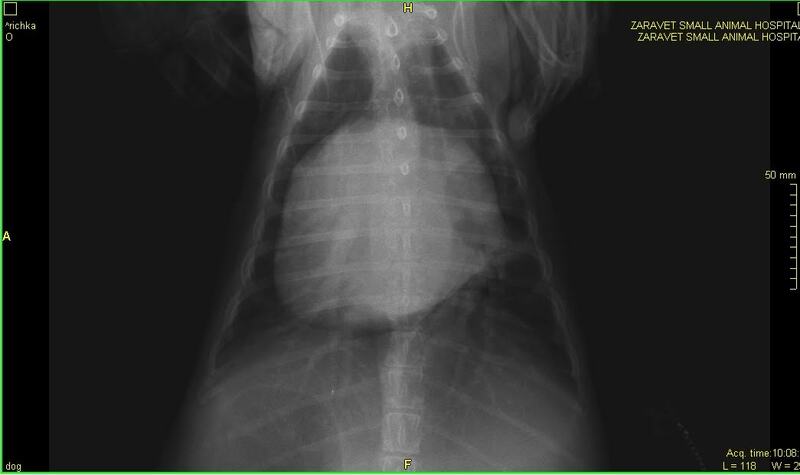 Considering the four episodes of clinical manifestation of canine babesiosis in this patient, cardiac enlargement may be related to this. 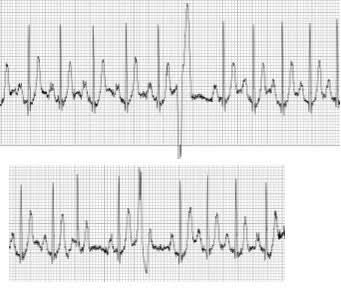 Tachycardia-induced cardiomyopathy is characterized by cardiac dilatation and systolic and diastolic dysfunction due to long-term increased heart rate, however these changes may be easily confused with DCM. Clinical studies in human medicine have suggested that the left ventricle internal diameter and volume are significantly smaller in patients with TIC than in those with DCM . Another difference between the two pathologies is that the ventricle remodeling during TIC may benefit from partial or total reversibility once the arrhythmia control is achieved . In the patient discussed in this paper, we observed a significant improvement in controlling the rhythm and heart rate after the antiarrhythmic therapy but not in the cardiac remodeling. 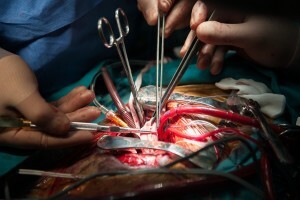 It remains unclear whether the arrhythmias were induced by the myocardial structural changes during the progression of heart remodeling or if the dilatation was induced by a chronic supraventricular tachyarrhythmia which later developed ventricular complexes and accelerated idioventricular rhythm. 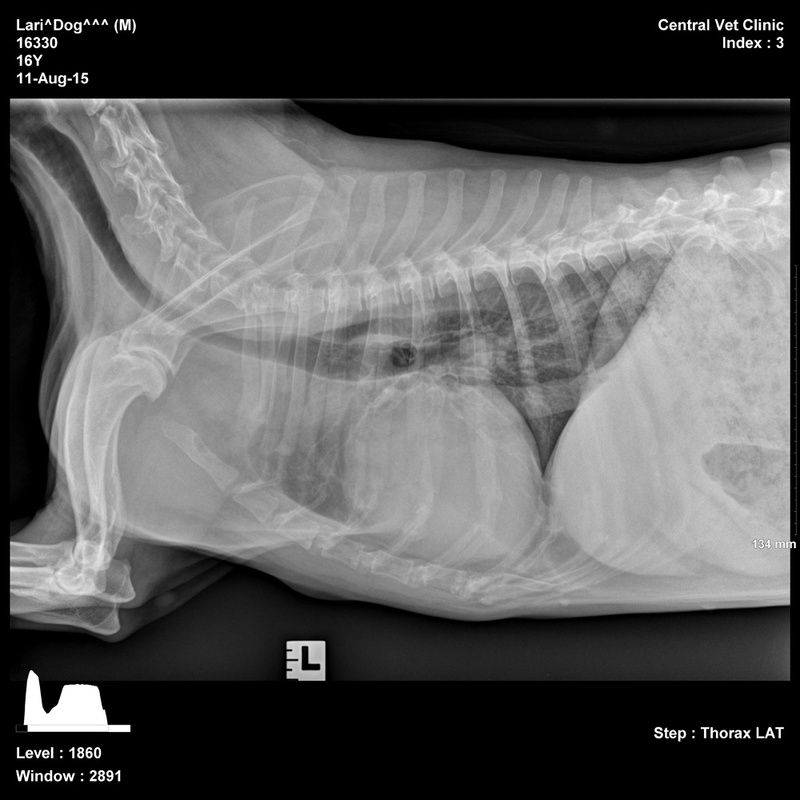 Dilated cardiomyopathy is a common cardiac disease in large breed dogs, however differential diagnosis must be considered when cardiac dilatation is present, in the absence of any certain factors. 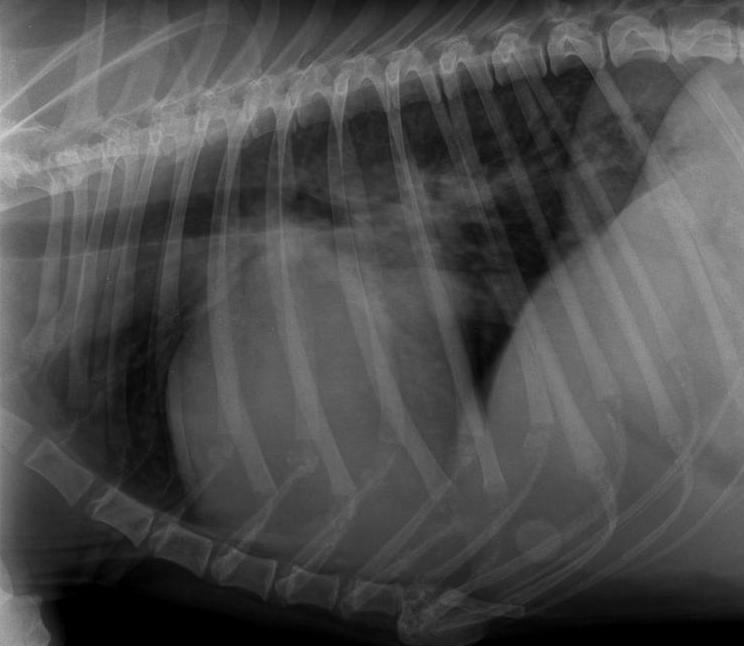 The dog from this report had cardiac dilatation associated with severe arrhythmia. 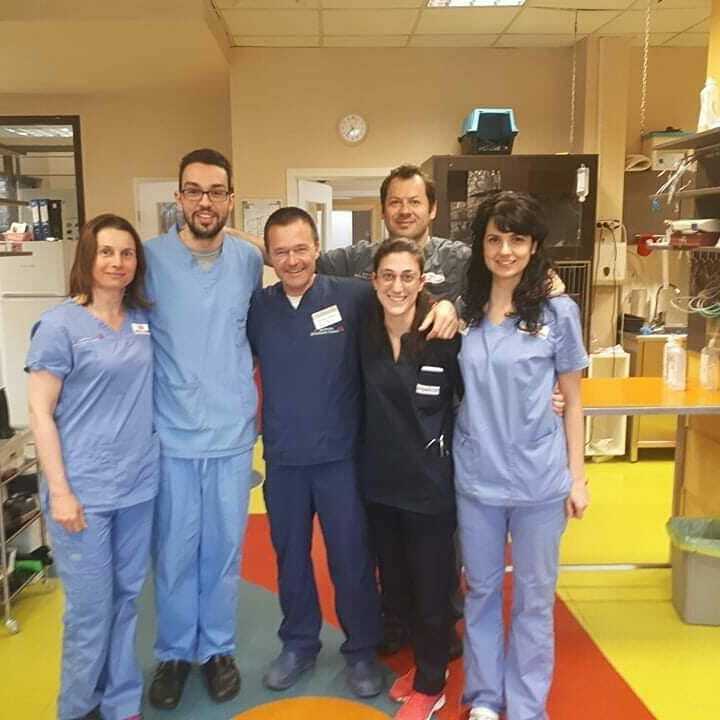 Although an etiologic diagnosis could not be established, we succeeded to improve the quality of life by controlling the heart rate and the rhythm. Pacemaker implantation is the most effective treatment for ‘syncope and severe exercise intolerance’ – related arrhythmias; however when searching for the best clinical decision for some older dogs, the risk of anesthesia often outweighs the benefits. We would like to share a case where the old age was not a problem. Larry was a 17-year old MI mix breed dog admitted because of increasingly frequent exercise intolerance episodes during the past few months. 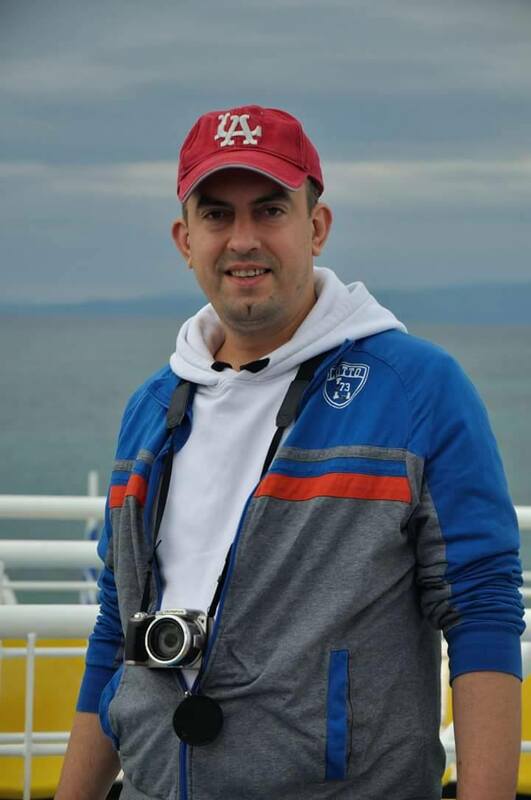 Furthermore, the last week the patient was very week, unable to stand on his feet and with a depressed overall clinical status. 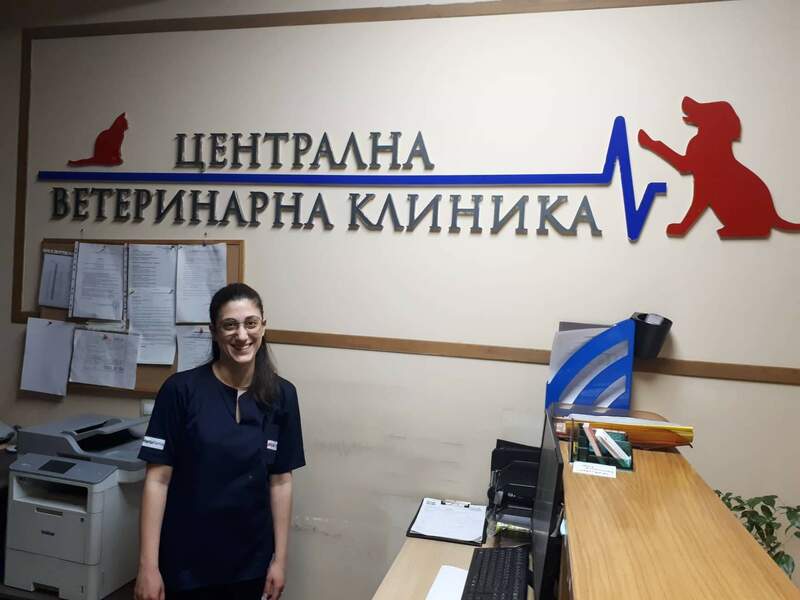 On a clinical presentation with the referring vet а bradycardia was noted and the patient referred to us for a Cardiology consult. During auscultation, a slow regular rhythm was detected with heart rate of 20 bpm classified as ventricular escape rhythm during the normal ECG. 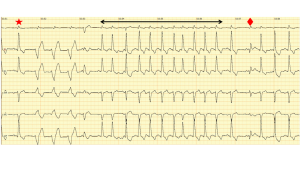 A 24hour Holter monitor revealed complete AV block (AVB III) throughout the study with an average rate of 31 bpm, occasional VE beats with some pairs, triplets and short runs; no pauses greater than 5 sec were noted. 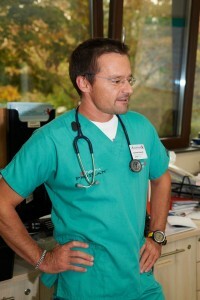 The slowest heart rate detected was 20 bpm. A diagnosis of complete AV block with clinical signs of right sided congestive heart failure was made and pacemaker implantation was decided. A VVI, bipolar, passive lead was fluoroscopically placed, under anesthesia, through the right jugular vein into the right ventricle, where it was successfully lodged.Lari_20150814181226_1819550 The lead was connected to a generator, which was later fixed in the subcutaneous tissue dorsally to the cervical vertebrae. A temporary pacemaker was used when the dog developed asystole during the procedure. 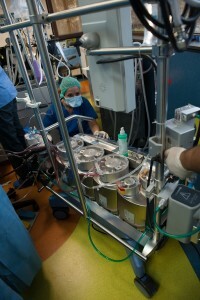 Recovery from the surgery was uneventful, with the pacemaker capturing normally. The pacing rate was set to 100 bpm. The system used was a ‘St Jude’ one. 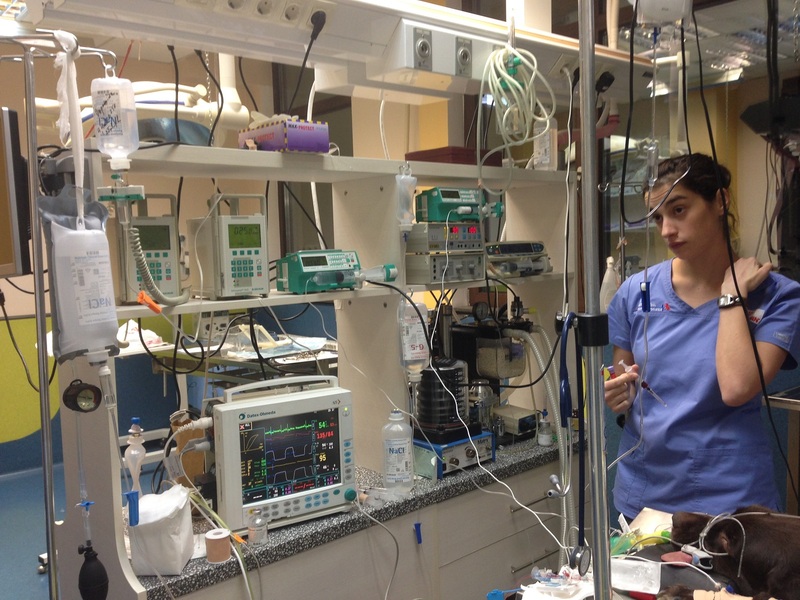 Our anesthesia protocol with this patient was routine for the procedure of a PMI – premedication with Midazolam and Buprenorphine, induction with Etomidate, intubation and maintenance with Isoflurane. The post procedure treatment was only with Cefazolin iv for the next few days. The use of a temporary lead and/or an external pacemaker is highly advisable in patients who are depended on their escape rhythm. 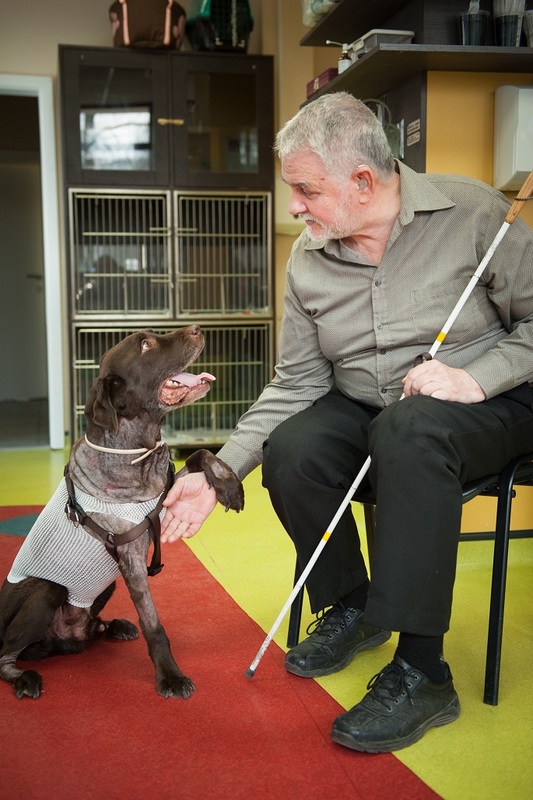 Even though Larry recovered from the general anesthesia normally he was unable to stand on his feet for additional 5 days. He was bright, alert and responsive, with good appetite and normal consciousness, but with an impaired proprioception. We attributed this to the long period with severe bradycardia (HR of 20 bpm) and potential vasoconstriction/reperfusion complications. There is some data in the human medicine literature concerning PMI in old people with preexisting severe bradycardia, who reported pain in the extremities post the procedure. Other factors such as chronic joint and spinal diseases could have been the cause of the slow recovery as well. The myoglobin levels were not checked prior to the PMI unfortunately. 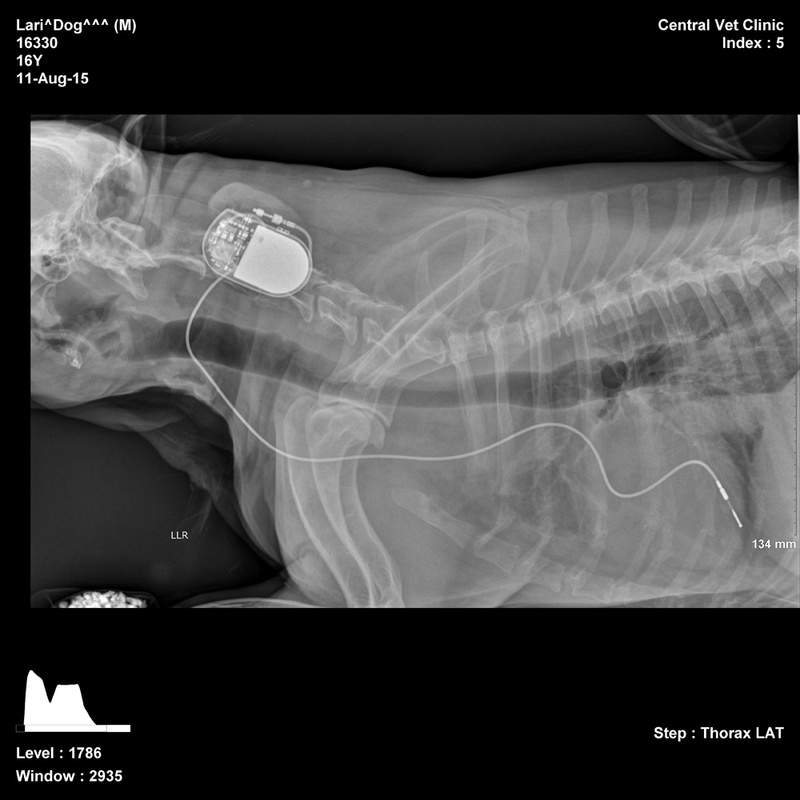 Pacemaker implantation may be warranted even in older dogs with ‘syncope and severe exercise intolerance’ – related arrhythmias. 7 months post the procedure Larry is still doing great; in this period he underwent two additional major surgeries for a prostate abscess – with no anesthesia complications.